KIEV, Ukraine -- The day after the European Union and the United States announced expanded sanctions against Russia over the conflict in eastern Ukraine, Moscow remained defiant, the Ukrainian Army remained on the offensive, and an international team remained unable to reach the crash site of a Malaysian jetliner. A senior Ukrainian official, Valeriy Chaly, said on Wednesday that his country welcomed the expanded sanctions, while Russian officials condemned and belittled them, saying they would prompt Russia to strengthen its economy but would just make a sour diplomatic atmosphere worse. Mr. Chaly, the deputy chief of Ukraine’s presidential administration, told reporters in Kiev that his government would not scale back its offensive against the pro-Russian separatists in eastern Ukraine. He said troops had already freed 60 cities and towns and more than one million residents from rebel control. But Mr. Chaly denied that the military was trying to seize control of the crash site of Malaysia Airlines Flight 17 by force. “We are not ready for such a scenario without the agreement of our international partners,” he said. The White House issued a joint statement Wednesday with the leaders of six other major industrialized nations condemning Russia for its intervention in Ukraine, and calling on Moscow to change course or risk further penalties beyond the new round of sanctions. 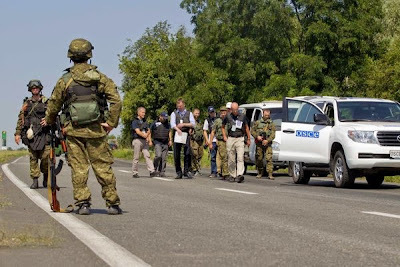 Earlier in the day, observers from the Organization for Security and Cooperation in Europe tried to get to the crash site but were turned back by reports of clashes and gunfire along the route. And a mission of Dutch police officers and experts said that after being similarly blocked on Monday and Tuesday, they would not attempt the journey on Wednesday. Pieter-Jaap Aalbersberg, the head of a Dutch recovery mission, said he did not “expect the security situation to improve enough over the next few days” to visit the crash site. The mission has been in Donetsk, the nearby provincial capital, since Sunday. The government of Belarus, a neighboring country on good terms with both Kiev and Moscow, said on Wednesday that President Petro O. Poroshenko of Ukraine had asked it to host talks among Ukraine, Russia and the Organization for Security and Cooperation in Europe over access to the crash site and other issues, Reuters reported. The office of President Aleksandr Lukashenko of Belarus said that “all interested parties” were invited, the news agency reported, but it was not clear whether the separatists would be represented or when the talks would convene. Andriy Lysenko, the spokesman for the Ukrainian government’s National Security and Defense Council, said the main obstacle to reaching and securing the wreckage of the plane was rebel resistance. “At the crash site of the Boeing 777, the terrorists have made new fighting positions,” he said. Russia, however, said Ukraine and the United States were fueling the violence in the area. “It’s not Russia but the Kiev regime and its overseas sponsors who are to blame for the growing number of victims among the civilian population of the eastern regions,” the Russian Foreign Ministry said in a statement. It said the expanded sanctions announced on Tuesday would make peace harder to achieve. Dmitri O. Rogozin, the Russian deputy prime minister in charge of the military industry, suggested that the United States had imposed new restrictions on arms and technology sales to Russia out of fear of its growing might. But Ukrainian leaders saw in the sanctions announcement a new unity and resolve in the West to rein in Russia. “What even a month or a month and a half ago was considered impossible has become a reality,” Mr. Chaly said. As the possible effects of the new sanctions were being discussed, the European Union on Wednesday placed three people close to the Russian president, Vladimir V. Putin, on a sanctions list. For the Russian business community and political analysts, the expanded sanctions are a blow to Russia’s economic prospects and a worrying sign that the country is becoming increasingly isolated. Some of the affected companies issued statements playing down the impact. VTB, a major Russian bank in which the government has a majority stake, said the new restrictions on its access to European financial markets would “not affect the bank’s work, nor its credit rating,” and had not been imposed because of anything the bank had done. “We consider this decision purely politically motivated, unjust, contradictory to the law and reciprocally harmful for the economy,” the bank said. Investors bid down the value of the ruble by 0.26 percent against the dollar on Wednesday. Opposition voices in Russia said the economy would nonetheless pay a price for what they called Putin’s misguided policy in destabilizing Ukraine. “I was asked whether sanctions will stop Putin,” Boris Y. Nemtsov, a former deputy prime minister, wrote on his Facebook page. “My answer is no, they won’t,” he wrote, suggesting that sanctions might even fuel Putin’s zeal to punish Ukraine for trying to leave Russia’s orbit. “Only the Russian people can stop him, when they ultimately understand that the crazy man cornered and impoverished them,” he said. My understanding is that Russia will not be willing to return the Crimea for a near future, and this is the decision made by Russian Government well, it will most likely mean increasing isolation. It is my personal believe that, there will be stronger wiliness in the next US Government to push isolation of Russia even much farther, due to annexation of the Crimean peninsula.